Ordinance No. 26, Series of 2014 - Ordinance requiring all food service industry to include half cup of cooked rice in their menu. Ordinance No 09,Series of 2000 - Establishing Small Business Incubators Program. Ordinance No.1, Series of 2006 - Establishing a Community Kiln Oven Facilities for the Clay Industry. 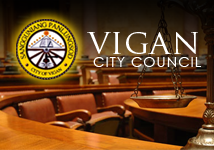 Ordinance No.3, Series of 2007-Amending the Vigan Investment Incentive Code. Ordinance No.7,Series of 2007-Repealing Chapter VIII,Sec.20 of Investment Incentives Code. Ordinance No.17,Series of 2003- Creating the Vigan City Small Business Action. Ordinance No.19,Series of 2008-Amending Section 11 of Investment Code-inclusion of BPO. Ordinance No.10,Series of 2005- Creating the Vigan Traditional Industry Development Board.